Invitations to exhibitions at Semaphore East gallery. Left to right: Mark Kostabi at Semaphore and Semaphore East, 1985; Keith Haring/Tseng Kwong Chi at the opening of Semaphore East, 1984; Bobby G at Semaphore and Semaphore East, 1984. Though ephemera by definition is made without an eye to the future, its collectors treasure ephemera for its ability to call to mind forgotten history. 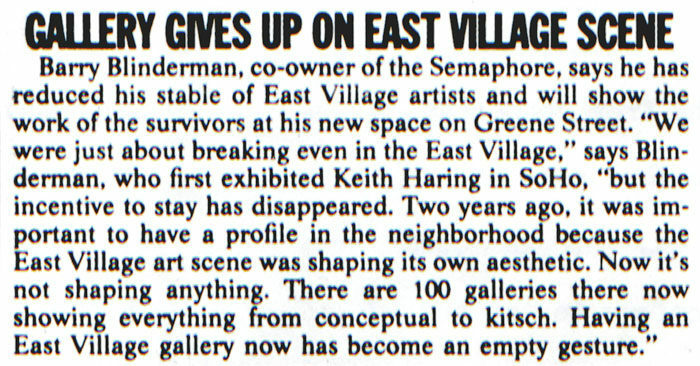 Among a collection of ephemera recently acquired by Gallery 98, a scabrous piece of samizdat by artist Mike Cockrill attacks his former dealer Barry Blinderman for closing Semaphore East gallery—a decision that, for some, symbolized the meteoric fall of the East Village art scene. In fact, Semaphore East had been a late addition to the East Village. Under Blinderman’s direction, the original Semaphore in Soho had helped launch the careers of several East Village art stars—Mark Kostabi, Martin Wong, Lady Pink, Futura 2000, Jane Dickson, Raymond Pettibon, Walter Robinson, and others—but it wasn’t until 1984 that the gallery established its East Village outpost. By this point, the neighborhood’s art scene had already peaked. Starting with Keith Haring and Tseng Kwong Chi, Semaphore East hosted a string of memorable exhibitions; but when best-seller Kostabi decamped, the writing was on the wall. Cockrill’s 1986 “short story” depicts Blinderman’s decision to close Semaphore East as a betrayal of the East Village ethos. In it, the off-kilter author/protagonist confronts “the Dealer” to withdraw his work from the gallery and prepares for an artists’ strike. In fact, a consolidated Semaphore briefly survived in a new Soho space, but Blinderman soon left New York to direct the University Galleries of Illinois State University, in Normal, Illinois. Blinderman remains to this day in Normal, where he has organized important traveling exhibitions on David Wojnarowicz, Keith Haring (both 1990), and, most recently, Walter Robinson (a retrospective that came to Deitch Projects in 2016). Cockrill also continues to paint and exhibit: a retrospective of his work is currently on view at Cross Contemporary Art in Saugerties, NY. Mike Cockrill’s ’zine “Semaphore Walkout!” and its sequel, “Break In!” (both 1986). The latter work describes Cockrill’s escalating battle with his former gallerist, Barry Blinderman.